On May 30, 2006, Jeff Huffman and I began our journey here at Chops Percussion. We had taught together before that and we had been roommates a couple of different times, so the two of us teaming up together to start Chops made perfect sense. For 12+ years now, the team known simply as “Jeff and Derek” have held down the fort here at Chops, which is what makes this blog so difficult to write. Made official as of this past Tuesday, Jeff will no longer be with Chops Percussion. He is moving on to a job with Hoshino USA, to help grow the Tama Marching Percussion line of instruments. 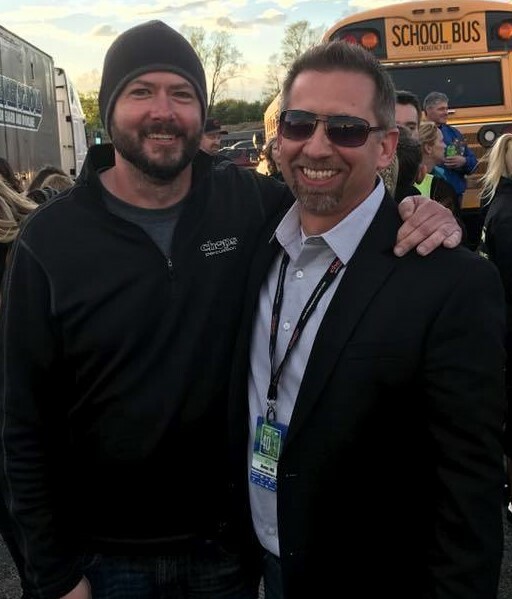 Jeff is perfect for this position when you consider not only his dealer experience, but also his 6+ years of experience with the Tama product while leading Avon HS to multiple IPA State Championships and WGI PSW Finals appearances. Hoshino is very lucky to have him, and we are very sad to see him go. I can assure you of this: no one is sadder about this than I am, but I know Jeff will be great at his new gig and Tama will be a stronger brand because of him. His last day at Chops Percussion is this Friday, July 6. Our customers can rest assured that Chops will continue to offer the same great products, high-level service, and product knowledge you have come to expect these last 12 years. I know many of you reading have worked closely with Jeff over this time, so please join me in congratulating him on a job well done here and wishing him well in his new endeavor. If you wish to say something to him on our Facebook page or your personal Facebook page, please use the hashtag “ThanksJeff”. Feel free to use that hashtag on other social media sites as well. Chops will not be the same without you, my friend. I wish you the very best in this new job and look forward to your visits as our new Tama Marching Percussion rep!